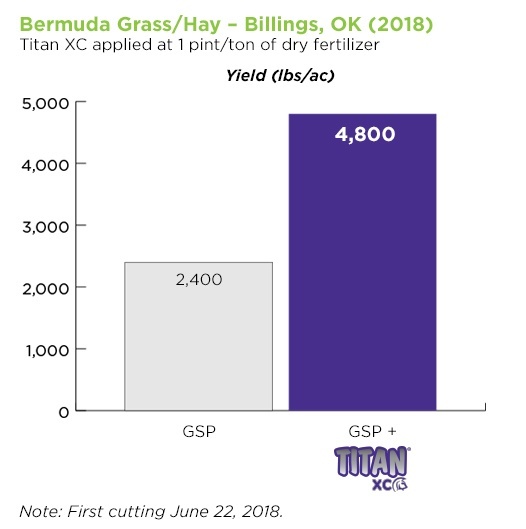 For the trial, Titan XC was applied at 1 pint/ton to the grower's dry fertilizer blend, consisting of N-P-K with sulfur. Treated and untreated fertilizer was applied to the field, which was located near Billings, Oklahoma, on April 17, 2018 (64 acres treated and 52 acres untreated). The first cutting was taken on June 22, 2018. Yield numbers were determined by weighing bales from five windrows each in the treated and untreated areas. 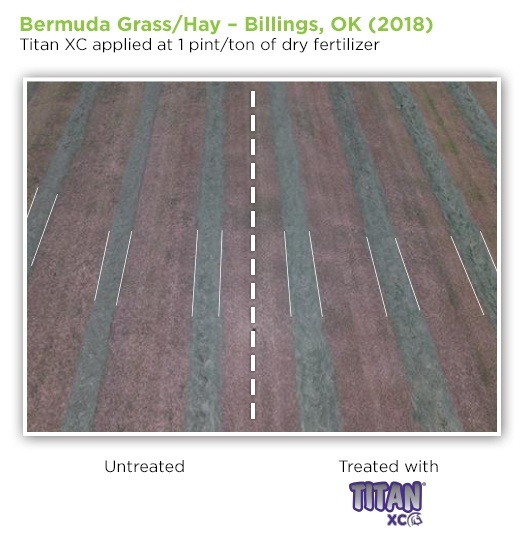 Titan XC can be applied in spring or fall to help maximize nutrient release from dry fertilizers. Learn how Titan XC can add value to your farming program by downloading the Titan XC booklet.